With the plethora of mushrooms after our well deserved rainy season here in California, we were able to taste many kinds of local mushrooms. Chef Poppy paired portobellos from the Grey Bears walk-in cooler with polenta and pasta. I brought in a few other kinds of mushrooms, sautéed them up, and we tasted them to enjoy the nuanced differences. The best way to clean the mushrooms is with a mushroom brush, which we didn’t have, so Martha took a clean dishcloth and rubbed any dirt away. I do not recommend washing mushrooms with water. They are quite porous and can absorb the water, diluting the specific taste of the mushroom. And a little dirt won’t hurt. Portobello: thick and meaty, excellent grilled. 1. Using a fry pan, add olive oil and sliced onion, cooking slowly on low heat to caramelize (about 30 minutes). Put aside. 2. Snap off stems of portobellos and slice into lengthy pieces, not too thin. 3. 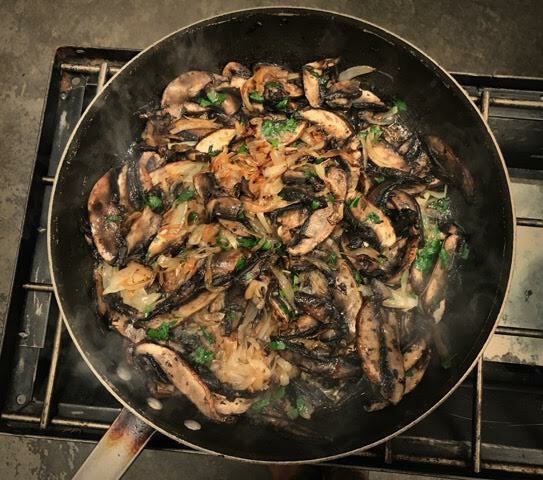 Using another fry pan with olive oil added, sauté mushrooms until slightly limp. Polenta is boiled corn meal. You can buy the package that says polenta or you can buy the package that says corn meal. The difference will be in the grind of the meal. I like the coarser grind, but you can experiment with the finer grind and make your own decision. The ratio of polenta to liquid is 1:4. We used half water and half milk, which makes the polenta creamy. You can also use chicken or vegetable stock. 1. Combine water and milk in saucepan. Add salt and bring to a boil. 2. Add polenta slowly and turn down the heat until is is a slow boil. Stir continually for about 15 or 20 minutes, or until all liquid is absorbed. Polenta is extremely versatile. 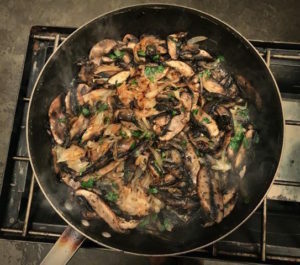 We served it with the mushroom/onion/parsley mixture, but you can put anything with it. Some ideas: chopped avocados and tomatoes, sautéed chicken breast, sautéed chard … really anything. We also had some chicken on Saturday. I put olive oil on the chicken along with rosemary, salt and pepper and baked it at 400 degrees for about 45 minutes. Please email me with any questions about these recipes. And please put Saturday, April 22 in your calendar for our next class. We will experiment with some Indian spices. Thanks for coming!